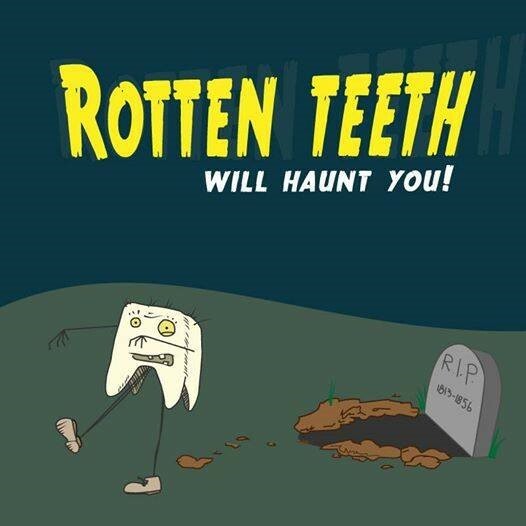 Rotten Teeth Will Haunt You! Halloween is around the corner, which for most children means bags of free sweets and a chance to build a stockpile of sweets for the winter. No surprise, Halloween can also present parents with a variety of health and safety challenges. Here’s how you can help your families teeth survive this tricky (or treat-y) time. Eat Halloween sweets (and other sugary foods) with meals or shortly after mealtime. Saliva production increases during meals. This helps cancel out acids produced by bacteria in your mouth (in response to the sugar) and rinse away food particles. Snacking can increase your risk of cavities, and it’s double the trouble if you keep grabbing sugary treats from the sweetie bowl! Snacking on sweets throughout the day is not ideal for your dental health or diet. Avoid hard sweets and other sweets that stay in your mouth for a long time. Aside from how often you snack, the length of time sugary food is in your mouth plays a role in tooth decay. 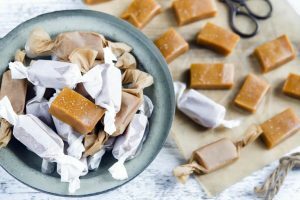 Unless it is a sugar-free product, sweets that stay in the mouth for a long period of time subject teeth to an increased risk for tooth decay. Sticky sweets cling to your teeth. The stickier sweets, like toffee and gummy bears, take longer to get washed away by saliva, increasing the risk for tooth decay. This includes fizzy drinks, sports drinks and flavored waters. When teeth come in frequent contact with drinks that contain sugar, the risk of tooth decay is increased. Chewing sugar free gum for 20 minutes after meals helps reduce tooth decay, because increased saliva flow helps wash out food and neutralize the acid produced by bacteria. You might even want to think about giving sugar free chewing gum out as a treat instead of sweets says at Halloween. Brush your teeth twice a day for two minutes with a fluoride toothpaste. Remember, replace your toothbrush every three, or sooner if the bristles are frayed (or if you’ve been poorly in that time). A worn toothbrush won’t do a good job of cleaning your teeth. Regular visits to your dentist can help prevent problems from occurring and catch those that do occur early, when they are easy to “treat”. 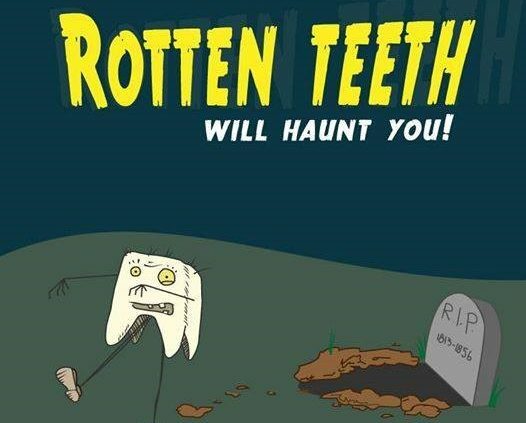 https://absolute-dental.co.uk/wp-content/uploads/2018/10/rotten-teeth-will-haunt-you.jpg 526 526 Absolute Admin https://absolute-dental.co.uk/wp-content/uploads/2016/11/absolute-logo-NEW1.png Absolute Admin2018-10-30 09:55:502018-10-30 09:55:50Rotten Teeth Will Haunt You! The first female dentist (UK) 7 Bizarre Facts About Cheese!